They are used as decorations for an array of parties and festivities, they uplift the spirits of the sick, serve as congratulatory tokens and brighten the faces of children -- helium balloons are used for many occasions and purposes. For whatever reason you have helium balloons, if you're ready to deflate them, you can do so quickly and easily without popping them. Hold the balloon in one hand. Tuck the balloon underneath the arm in which you are holding the balloon. Don't press on the balloon too hard with your arm, as you'll risk popping it. Pinch above the knot. Use your thumb and forefinger to pinch the balloon just above the knot on the inflated part of the balloon. Push the balloon back. with your free hand, pull the knotted end of the balloon slowly through your pinched fingers -- a flattened gap will be created between the balloon and the knot. Cut the knot off the balloon. With your other hand, use a pair of scissors to slowly cut through the flattened gap created on the balloon, cutting off the knot. Release the helium. Slowly squeeze the balloon to release the helium, deflating the balloon. Throw out all remnants of the balloon. 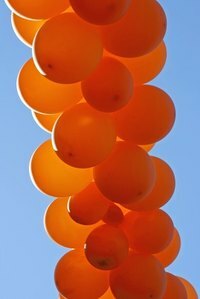 Balloons can pose a choking hazard. Use caution when deflating a balloon around pets and small children. Save Mylar balloons to reuse or place in a memory book. The deflation process only requires a drinking straw.